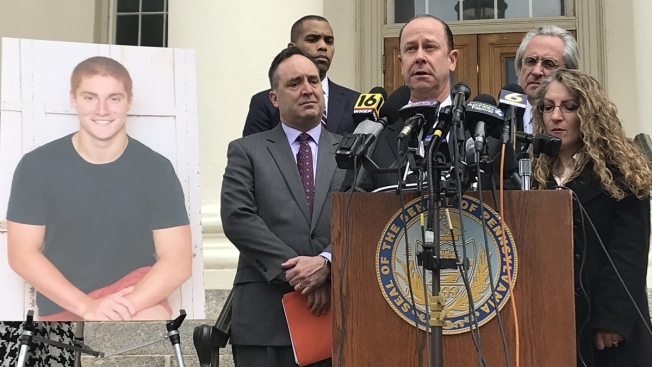 "I'm a big momma's boy, and hearing moms talk about their sons being hazed to death broke my heart"
In this March 23, 2018, file photo, Jim Piazza speaks at the announcement of an anti-hazing bill in Pennsylvania named for his son (pictured at left). A group of parents whose sons died from or were affected by fraternity hazing incidents have banded together to strengthen laws and policies and to appeal directly to fraternity members to stop the potentially dangerous practice, NBC News reported. The first goal of the Anti-Hazing Coalition is to pass legislation in Pennsylvania named for Tim Piazza that would punish hazing with prison time. 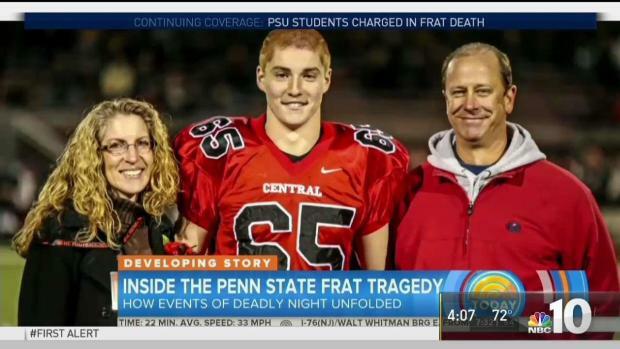 Piazza, 19, died after fracturing his skull in an alcohol-fueled Penn State University hazing ritual. His parents, Evelyn and Jim Piazza, told their sobering story to a group of 500 fraternity brothers at a gathering in Phoenix this month, the first time they spoke together to stop the kinds of incidents that killed their son. They called their talk, which touched on the moment they said goodbye to an unconscious Tim, "Love, Mom and Dad." "I'm a big momma's boy, and hearing moms talk about their sons being hazed to death broke my heart," recalled Spencer Bradbury, president of Sigma Alpha Epsilon at the University of Colorado at Colorado Springs, after the event. The group of parents have already gotten a law passed in Louisiana — named for Max Gruver, who died after a forced-drinking ritual at Louisiana State University — and have set their eyes on Georgia.